Calling all young ladies, ages 10-14! Monday, February 23 starts Engineering Week for the College of Engineering at the University of Miami. They are having a Simulation Lab Demonstration Event from 10:00 AM – 1:30 PM, in which students will be led through different simulations by PhD students. Light breakfast and lunch will be provided. Only 20 seats left! Let’s make this a great first day to Engineer Week! HOMESTEAD, Fla.: Homeschoolers can get a taste of living history at the Fifth Annual Vintage Day Celebration at Everglades National Park on Saturday, March 7, 2015, from 10 a.m. to 3 p.m. 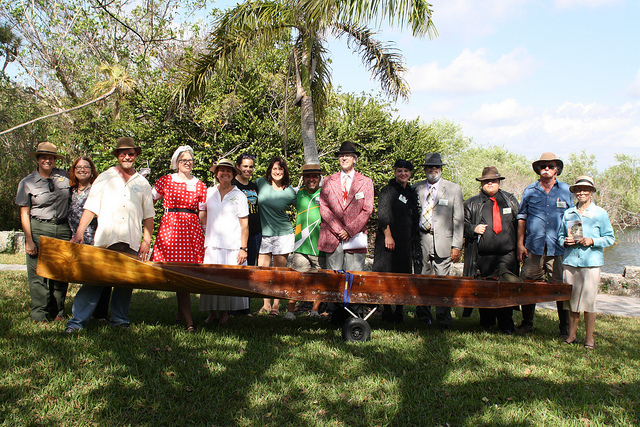 Visitors of all ages will have the opportunity to interact with costumed characters representing the “dreamers and schemers” that shaped Everglades National Park as we know it today. There will also be special tours and presentations by local authors and historians. Guests can leave their cars at the Ernest F. Coe Visitor Center and ride back in time on the Homestead National Parks Trolley to Royal Palm, where they can complete a souvenir newspaper by chatting with the likes of Henry Flagler, Napoleon Bonaparte Broward, Marjory Stoneman Douglas, Guy Bradley, Arthur R. Marshall, Barron Collier, Ernest Coe, and Zora Neale Hurston. Also represented will be Gladesmen, plume hunters, early park wardens, botanists, conservationists, and Cold War era soldiers. The Homestead National Parks Trolley will also be providing its regularly scheduled free transportation to the park from Losner Park in historic downtown Homestead. Guest speakers will include author and activist Audrey Peterman, Florida International University Professor Peter Machonis, historian Cesar Becerra, and Mark Pafford, CEO of the Arthur R. Marshall Foundation. Guided tours of the old Royal Palm State Park will also be available. This historical area was owned and protected by the Florida Federation of Women’s Clubs in the first half of the twentieth century and became the nucleus for Everglades National Park. There will also be guided walks of the Gumbo Limbo Trail led by botanists, as well as a special tour of the historic Nike Missile Base. In honor of the park’s Vintage Day Celebration, free admission will be provided to all visitors at the main park entrance near Homestead, and all Vintage Day activities are free of charge. WHAT: Fifth Annual Vintage Day Celebration; free park admission for all visitors at the main park entrance near Homestead. WHEN: Saturday March 7, 2015, from 10 a.m. to 3 p.m.
WHERE: Royal Palm. Visitors coming from the Miami area and points north should take the Florida Turnpike (Route 821) south until it ends merging with U.S. 1 at Florida City. Turn right at the first traffic light onto Palm Drive (State Road 9336/SW 344th St.) and follow the signs to the park. Visitors driving north from the Florida Keys should turn left on Palm Drive in Florida City and follow the signs to the park. For more information, call (305) 242-7700 (during regular business hours, Monday – Friday, 8:00 a.m. – 4:30 p.m.).